Celular Shield RTQ ™ ofrece una mezcla propietaria, altamente biodisponible de tres poderosos antioxidantes (resveratrol, cúrcuma y quercetina) para la protección potente contra los radicales libres que dañan las células. * USO SUGERIDO: Tome dos cápsulas al día. 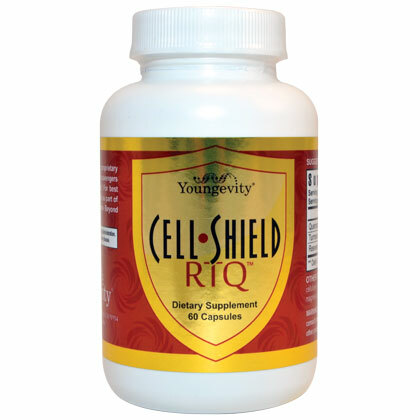 Cell Shield RTQ offers a highly bioavailable proprietary blend of three powerful antioxidants (resveratrol, curcumin and quercetin) for powerful protection against free radicals that damage cells. * For best results, use Cell Shield RTQ as part of a complete nutritional program that includes Beyond Tangy Tangerine and Ultimate EFA Plus. SUGGESTED USE: Take two capsules a day. WARNING: If you are pregnant, nursing or taking medication, consult your health professional before using this or any other product. KEEP OUT OF THE REACH OF CHILDREN.